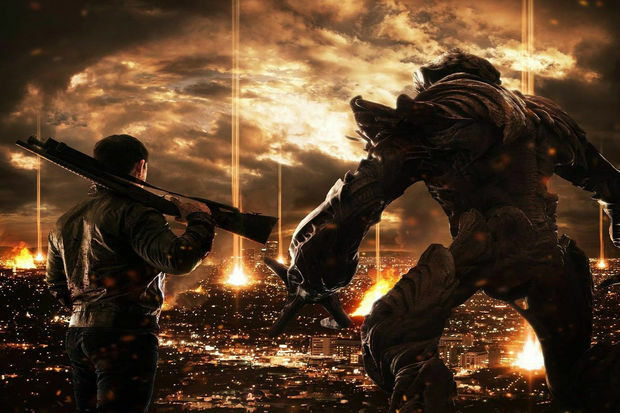 Screen shot from "Beyond Skyline," a film directed by Liam O'Donnell that will close out Cinepocalypse. LAKEVIEW — A brand new, weeklong film festival is coming to the Music Box Theatre. Cinepocalypse, which evolved from Bruce Campbell's Horror Film Festival, was developed by Josh Goldbloom in an effort to expand his horror festival into a genre film festival, adding sci-fi, action and "anything odd" to the mix. The festival lasts Thursday through Nov. 9 and features more than 60 films, many of which will be getting their U.S. or world premieres. Guests can buy tickets to individual movies, passes to part of the festival or passes to the entire festival online. There will also be special guests, including writer/director Larry Cohen ("Phone Booth," "Cellular"), filmmaker Joe Carnahan ("The Grey," "The Blacklist"), actor Antonio Fargas ("The Gambler," "Shaft"), actor Eric Roberts ("The Dark Knight," "The Cable Guy"), screenwriter/guest host Simon Barrett ("The Guest," "You're Next"), "Re-Animator" star Barbara Crampton, "Suspiria" star Jessica Harper and more. Goldbloom said he thinks the festival will offer a special experience for people to discover some great movies because he and the team at the Music Box have so much respect for movie-making and movie-going. "It's the discovery aspect that makes this special," he said. "It's like you're the first core group of people being able to discover these types of films. For us, what's so important about it is we understand the blood, sweat and tears that go into making these types of momvies, and we take it personally to be able to give back to the filmmakers and set up an environment where we say, 'We appreciate the amount of effort you put into your work, and we want to match that.'" Goldbloom, who lives in Philadelphia, said the Music Box Theatre has been on his mind for years as the perfect place to develop a festival like this. "I'm obsessed with the Music Box Theatre," he said. "I think it's one of the most beautiful spaces to see a movie in the United States. It's just the best of the best. You don't see those types of spaces everywhere; we're able to showcase 35 and 70 mm, it's in a beautiful neighborhood in Chicago — it's a real treat." For a full schedule and more information on each film, visit the Music Box Theatre's website.